We were at the edge of our seats during last week’s Apple event, where the company announced two brand new tablets: The iPad Air 2 and iPad mini 3. 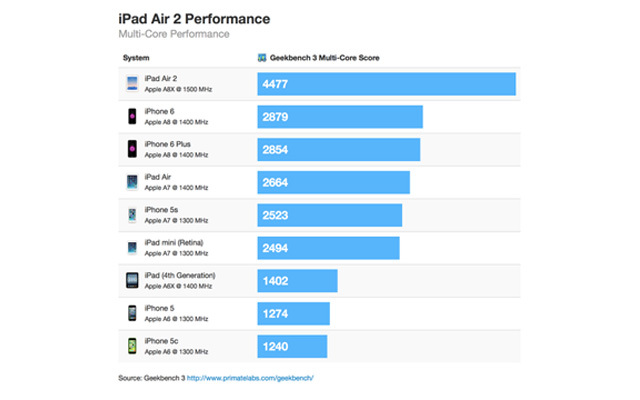 As to be expected, the new and faster-than-ever iPad Air 2 was loaded with upgrades from last year’s model, but a recent Geekbench testing revealed that the world’s thinnest tablet packs some pretty impressive numbers to back those claims up. Its new processor power makes the iPad Air 2 as much as 55% faster than the company’s latest iPhone 6 and iPhone 6 Plus, and an impressive 68% faster than last year’s iPad Air model. Still- Apple’s going to make you wait. While the site is accepting preorders right now, the new iPad Air 2 won’t officially be released until the end of this week. Can’t wait to get your hands on the slimmest protection for the slimmer-than-ever iPad Air 2? Sign up to be notified when our cases are ready, and shop iPad mini 3 cases NOW!